Two weeks ago, I attended a talk by the renowned Frank Shu. A University Professor Emeritus of UC Berkeley and UC San Diego, Shu expounded the reasons humans would struggle to colonize Mars. Being an astrophysicist on alternative energies, he also discussed how green technology could aid in space exploration. Shu’s argument revolved around three main points: the psychological and physical impact of space travel on humans and the technological shortcomings of space exploration. Space travel is still inherently dangerous. There is little room to move and you’re in constant danger from radiation and micro-meteorites. Shu affirmed that research groups are looking at how to maintain mental health in extreme environments, including using interventions such as meditation and the positive impact pictures of nature can have on space travelers. Virtual Reality might also help by giving the astronauts a rest from the monotony. NASA astronaut Sunita Williams is held down by a bungee harness as she exercises on the Combined Operational Load Bearing External Resistance Treadmill. There is no gravity on the International Space Station (ISS), and Mars only has about a third of Earth’s gravity. This plays havoc with the human body. Our muscles are so used to fighting gravity on Earth that its absence means they weaken and waste. Tight, elastic body suits developed by the Soviet space program, attempt to mimic the effects of gravity on muscles by providing a deep compression force on the skin, muscle, and bone—meaning they have to work harder to perform normal movements. But, they don’t perfectly mimic the gravity on Earth. Secondly, a common hazard on the ISS is the fine specks that float around the cabin, often lodging in the eyes of astronauts and causing abrasions. Most astronauts also lose some of their vision after returning to Earth. The deterioration results from the fluid shift to the head building up in the skull where it bulges into the back of the eyeball and changes the shape of the lens. Studies are still being conducted to understand how this bulge forms and what can be done to prevent it. 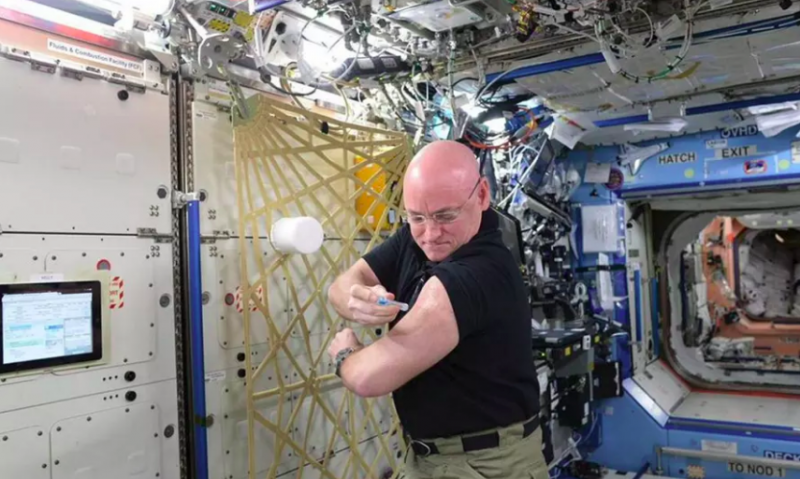 Astronaut Scott Kelly administers the flu vaccination to himself aboard the International Space Station. Furthermore, the human immune system doesn’t work as well in space, so mission members are isolated for a few weeks before lift-off to guard against illness. Shu reiterated that the bacteria in space is more dangerous and infections, diseases, and other illnesses are more contagious. Cost overruns are also not uncommon for large projects in any arena. The risk for cost overrun in the Mars One mission is reduced by using existing technologies, and by the fact that about 66% of the cost is associated with launch and landing–both of which are well understood and proven variables. The proposed Mars One budget includes a large safety margin to take into account significant mission failures as well as smaller but costly failures of components on Mars. Mars One has developed a detailed risk analysis profile which guides both its internal technical development as well as the relationships it builds with its aerospace suppliers. This risk analysis profile will continue to evolve and improve over the years prior to the first humans walking on the planet Mars. Furthermore, permanent settlement allows Mars One to use technology that is not substantially different from existing systems. The hardware specifically needed for this mission still needs to be designed, built, and tested extensively but the technology already exists, like rovers, mars suits, and communication satellites. It was an incredible talk, and I learned that we, as humans, had a lot to accomplish before colonizing Mars. Keen to pursue my undergraduate education at Berkeley, I saw my future in Frank Shu. And I truly loved it! Next Next post: How to make a change?